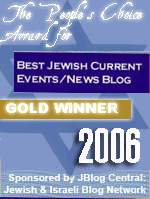 Like virtually every political step Israel has taken since 1991, the Disengagement from Gaza and the blockade of Hamas was done under the assumption that if Israel took the most moderate path possible (short of actual national suicide) the world community would be reasonable about it and work together to isolate the "extremists" and stabilize the region. That assumption has been repeatedly shown to be false. The world is not interested in being reasonable. 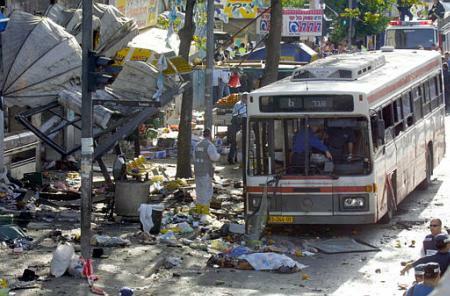 It has no litmus test that Muslim terrorists can ever fail, and no test that Israel can ever pass. Israel's Border Wall and the Blockade of Gaza were bare minimum attempts by Israel to isolate itself from the terrorists, and isolate the terrorists from their arms suppliers in Iran and Syria. Not only did Israel give a free hand to Hamas, an Islamic group whose sole purpose is to wipe it out, but it continued allowing in aid and even provided medical assistance to Gaza residents. Both the Wall and the Blockade had the initial backing of the United States and a number of European governments. After all blockades were not a new tactic to the US and every country understood the legitimacy of having a border fence to protect your own border. But instead, the Wall was dubbed the Apartheid Wall, despite the fact that there were about as many Arabs on one side of it as another, and that the Arabs on the other side of it claimed to be members of a separate Palestinian nation. And the Blockade was redefined as Israeli piracy and oppression against the not particularly starving "People of Gaza". The Obama administration along with Europe is now calling for an end to the blockade. And Israel has a choice between either fighting a continuous war against naval incursions from Turkey and Iran, with leftist "Human Shields" to provide cover for the terrorists-- or reclaiming control over Gaza and driving out Hamas. The arguments for reclaiming Gaza are straightforward enough. The situation as it stands cannot be settled through any form of negotiation, as Hamas has made it clear that under no circumstances will it accept any form of permanent peace agreement, only temporary truces. The world is no longer demanding that Israel negotiate with terrorists, as it had in the past with the PLO. Instead it is demanding that Israel stop interfering with the terrorists. Not because this will bring peace through negotiations, but because they have accepted the national claims of Hamas, a genocidal Islamist terrorist organization. This is obviously an unsustainable and unacceptable demand. Despite numerous attempts to find "moderates" willing to negotiate, Hamas remains dedicated to working together with Iran for the planned genocide of the Jews. Its charter contains the quote: "The Day of Judgment will not come about until Muslims fight the Jews (killing the Jews), when the Jew will hide behind stones and trees. The stones and trees will say O Muslims, O Abdullah, there is a Jew behind me, come and kill him" as its raison d'etre. And as the world is no longer willing to back Israel's passive approach to containing Hamas-- then the country has no choice but to move to active suppression. Since the attempts by Islamist regimes in Iran and Turkey to aid Hamas now have the approval of the world, further attempts to maintain the blockade are futile. The blockade of Gaza was based on the idea that Israel could isolate Hamas and thereby peacefully remove it from power. Instead Muslim regimes and left wing activists have instead once again isolated Israel. The mistake that Israel made once again was to imagine that reasonable behavior would produce cooperation. Instead once again the world rewards Islamic terrorists and punishes their victims. Furthermore, Israel left Gaza, and forcibly ethnically cleansed Jewish towns and villages in the area, as part of an understanding with the US on the status of other Jewish towns and villages. The Obama administration has since then chosen to not only ignore that understanding, but to expand its definition of "settlements" to include Jews living in Jerusalem. The Obama administration has unilaterally revoked the understanding reached with Israel that was the basis for the Gaza Disengagement. As such Israel has every right to reverse its own disengagement. By leaving Gaza alone and only monitoring its borders and coastlines, Israel displayed superhuman patience and tolerance for terrorists. But if the world refuses to back a naval blockade, then Israel has no choice but to take control of the ground. If the Obama administration refuses to accept the understanding on which Israel's original withdrawal was based, then it is time to reverse that withdrawal. The ongoing imprisonment of Gilad Shalit, Hamas' own atrocities against fellow Arabs and the presence of Al Queda in Gaza-- are all additional factors that demand action. The world's implicit endorsement of Hamas territorial rights leaves Israel with only two choices, to allow Hamas to function as a country, or to reclaim the area and shut Hamas down for good. Since Hamas is not willing to negotiate a permanent peace agreement and remains dedicated to terrorism and war, the former option is completely unworkable. Especially with Iran, Syria and Turkey being all too eager to arm and use Hamas as a proxy to justify a war with Israel. The latter option then is the only one that remains on the table. Either Israel will retake Gaza now, or it will have to retake it as part of a regional war. Retaking it now will mean less bloodshed on both sides. And possibly avoid a regional conflict. Right now Hamas is playing the Volksdeutsche to Iran's Germany and Israel's Czechoslovakia. Spurious claims of civil rights are being used to carve Israel up in preparation for a full invasion. And the likes of Ahmadinejad and Erdogan are competing over who will play Der Fuhrer and who will play Il Duce in this scenario. A full fledged Hamas state in Gaza will be an Iranian barracks and naval base inside Israel. And once Israel concedes on the sea, it will have to concede on the air too. Because the same "activists" who sail ships, will be able to rent planes too. And Israel will not be able to board those mid-air. It will have to choose between shooting them down and creating more "martyrs" and world outrage, or letting Iran ferry weapons through the air directly into its territory. As of now, Egypt does not want Gaza. 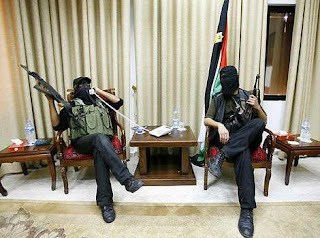 Fatah is not prepared to retake Gaza. Hamas is absolutely unwilling to negotiate a permanent peace agreement. The only thing left for Israel to do is retake Gaza, drive out Hamas and reassert control over the area. This will lead to short term violence, but long term peace. As opposed to the current scenario adopted by the Obama administration which leads to both short term violence and long term catastrophe. The blockade of Gaza has failed. Not because of Israel, but because the world could not make the right choice between a democratic country and a genocidal terrorist group that is second cousins with Al Queda. The blockade was Israel's concession to terrorism, a passive enforcement of its borders and interdiction of arms smuggling. The passive response is dead now. It's time to retake Gaza or face the consequences. always seem to cause more war. A less acute problem will turn into a major one ! And you think the Netanyahu gov't. has the balls to do this? Face it, the Israeli political elite is paralyzed, on the defensive, reactive, not proactive. I do see your point, Daniel, but something is missing. Israel drives out Hamas at great cost to herself in terms of both life and another PR disaster that offers a virtual free pass to the global Jihad. Then she presents Gaza to the PA, which is prepared to tolerate Israel's existence until it is strong enough to destroy her. Hmmm...this sounds like a non-smoker taking up the offer of a last cigarette before being blindfolded. The more I read of these changing events of history the more I think I must be the crazy one. Has the whole world turned into Dimmies? I get it from the Muslim point of view but how is it that the Western world dosen't see that this is just one more step to the next country on Islams march for world dominates. The religion of peace that has been hijacked by a few radicals we are told and here we have those same radicals being given legitimacy, ah democracy in the middle east it really, kinda, does work. If Israel doesn't have U.S. support will it then not have to make worthless peace agreements and go ahead and do what's right of Israel, and say f--- all of you or will the worlds reaction be to much for Israel? whats the point of taking Gaza? All that will mean will is Israel will be responsible for everything that goes wrong in Gaza -and the Gazans will make sure that there is plenty to go wrong. And in the usual manner they will ascribe all terrorist activities to 'occupation'. The UN, EU and the US, will stop financial support ( they would love to hit Israrl this way), and Israel will be left holding a real poison snake in its hands. Its not Gaza that is the problem but Gazans, or the Egyptians or whoever that populate Gaza. So yes, re-take Gaza, but in a manner or in a circumstance that is to Israel's advantage -- for good. Israel absolutely needs to start acting real tough. In this world, all the good, and the accolades, flow to the those who are strong and willing to to act so. The weak or the weak-willed, will be shown contempt. Israel is already responsible for all that goes wrong in Gaza, without being able to control what goes on in Gaza. If Israel is to be held responsible, it should be allowed to be in control of what it is being held responsible for. The Gaza blockade is a good place to draw a line. Easy to defend at low cost to Israeli risk of life. Gaza does not lack food or any other need of the populace so no video of suffering. 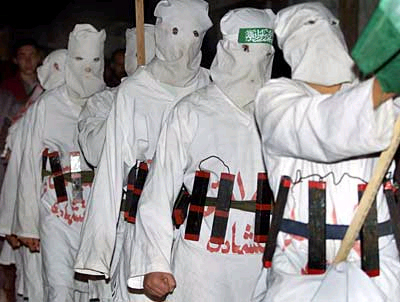 If we give in there, then Hamas is the new standard for acceptable behavior. Time to put maximum effort to counter the information war. Media, communications, internet. Take the fight to the media and try and link-up up with common themes that are resonating in America -- boarders, immigration, extra-territorial violence. Certainly there are orders of magnitude difference between Gaza and Arizona, but a large and increasing fraction of the American people understand the importance of these issues. Polls say something like 70%. As an alternative - or, perhaps, a prelude - why doesn't Israel simply shut its borders with Gaza completely and wash its hands of the territory. Let all aid go through Egypt. Gaza is enemy territory and should be treated as such. Then, when Gaza attacks, as it surely will, Israel can retaliate as forcibly as possible. The world will still scream, but it will be obvious what happened. "you can't win it in the media"
Sorry, Daniel, but I have to disagree. Arafat, Obama, et al, have done nothing but completely "exonerate" themselves thanks to a sycophantic media. Israel needs to change its PR image. It was seemingly hawkish from the 50s to the 70s. When it started appeasing, thanks to the Carter administration, like the US, it became pliable. I believe that if it took a more aggressive defense, akin to the Russian offense as in Chechnya and Somalia's pirates; the Arab street would shut up. Israel has never gotten backing from Washington, and it's an open question as to when there will even be a Republican President in office, and how pro-Israel he will be. Israel cannot make calculations based on waiting Obama out. It won't work. As for the media, the media hates Arizona. The only people won over by such an argument already support Israel. I am probably getting this all wrong, but I think Israel should retake Gaza for a number of reasons. They'd be in a better position to squash Hamas. They could also redevelop the land and turn it into an amazing resort or beach front community. It would be gorgeous similar to Italy, the Greek Isles etc. Why should waterfront property be used as a base camp for terrorists and their sympathizers? Idealistic I know and doesn't really address urgent conditions in Gaza but down the road Gaza could be wonderful but only under Israeli rule. I agree with commentators who say the retaking of Gaza would only serve to facilitate its reunification with the PA. It would cost IDF lives and would unleash a vicious wave of anti-Israel actions from governments, NGOs and terrorists. Always beware of unintended consequences. At the very least, the Palestinian state now would extend across Israel thanks to the land corridor promised to them by Olmert and Bush, and Israel would end up divided in two. The only solution with a long-term vision is to simply annex the territories, offer residency rights to non-terrorist Arabs (no more occupation, no more Apartheid), and those unhappy with the arrangement can be assisted financially to relocate elsewhere. The Arab demographic threat has been exaggerated. Read Ettinger's columns on the subject. The PR results of annexation would not be pretty either, but it would all be worth it in the long run. The status quo whether in the PA or Gaza has brought nothing but grief. It's time for a bold move. Annex the land. Israel has the right to the land under international law (League of Nations Mandate agreement adopted by the United Nations). DG wrote: Israel is already responsible for all that goes wrong in Gaza, without being able to control what goes on in Gaza. It is and it isnt. Israeli forces are not inside Gaza. They are not responsible for the day to day life of Gaza -;aw and order, food, hospitals, eduction(??). If Israel gets sucked in to Gaza, that would be a real calamity. Let them be, let them stew in their own juice - and wait for an opportune moment to change the strategic position - that is real prize. Israel is being held responsible, regardless of whether it is actually responsible. Which means that Israel might as well take control, if it's going to be held responsible anyway. 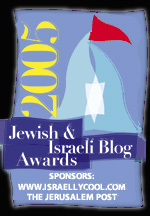 BTW: LOVE the new masthead for the blog!!!!! And what will Israel do once it reoccupies Gaza at whatever ridiculous cost in lives and treasure is dictated by the ruling elite's unwillingness to use proper military means? Piss away money and men with no end in sight while IDF soldiers play pop-up target for Hamas and al-Qaeda snipers and bombmakers? Continue to supply its enemies with food, funds, electricity and war materiel at ever increasing rates? Re-establish Gush Katif so it can be demolished once again when the pain and expense of endless, pointless pseudo-warfare gets to be too much while the lessons of the last "disengagement" fade from the collective memory of the addled Israeli public? Lets be crystal clear here. Israel cannot reoccupy Gaza because it is unwilling to fight. Israel is unable to blockade Gaza, either. Also because it is unwilling to fight. If you want to see what a REAL blockade looks like, go google "siege of Leningrad". Medinat Israel cannot win because it is unwilling to fight. It is unwilling to fight because it does not believe in its own right to exist. The only thing Medinat Israel is able to do is die. Its only choice is whether to die quickly or by slow stages. Only Medinat Yehudah could plausibly defeat Islamic terror. So this is your choice: Medinat Yehudah or Emirat Filistini Islami. Choose! I dont agree. Its one thing to be held responsible when Israeli soldiers and civilians are not in Gaza, another thing when they are on the ground in Gaza. How are you going to protect soldiers and civilians from each and any Muslim who wishes to stab or shoot them. Going into Gaza on an occupation basis, will hand Islamics the opportunity of close access to Jews to murder them - precisely what they want to get into paradise. Patience, and Gazans will hand Israel the opportunity to acquire real strategic value. Annexation cannot work unless there is the followup of transfer. The same goes for Judea and Samaria. Will the Frankists do it, absoulutly not. So as Vienna Mike states, we die slowly. Sad we can't wake up. Daniel, when are you going to escape the galut while we can still land at Ben Gurion. It's not going to remain this way for long. We are packing as I type. Israel is a nation destined to fight for survival against those that exist to fight. When she loses the will to fight, that is the beginning of her end. I believe Israel may not have quite lost but is certainly losing the will to fight. Now she clings to a fortress mentality, which is a politically correct form of slow and painful suicide. It has been said that no army can win by fighting on two fronts. Israel has fought a 60-year war on three fronts, and her enemies have just last week opened the 4th. well then make a Medinat Yehudah, but right now there isn't one. And I don't see a remotely realistic plan for making one. the same way they were protected before. If you have boots on the ground, you can control the situation and drive out organized terrorist groups. You can cultivate a network of informants. You can control the movement and flow of people. Right now Israel can't do any of those. And Israel is being held responsible anyway. That's the point. The world will blame Israel regardless of what it does, it might as well defend itself. Daniel, do you know who Vienna Mike is? Google "Virtual Medinat Yehudah". Whether or not he is a lunatic remains to be seen. But he definitely has a plan. 1) The world would equate it with genocide and you'd have UN troops taking over the country. 2) Jews cringe at the very thought of hurting non-Jews (we, who have suffered so much), and at what the world might think of us. - Do not give automatic citizenship to them or their offspring, but set up conditions for citizenship as it's done everywhere. Good behavior is one of them. But allow equal rights for all. Actually, equal rights for Arabs and Jews would be an improvement. At the present Arabs seem to have more rights: they can build wherever they want without permission, while Jews can't. They control Temple Mount and are allowed to pray openly, while Jews can't. They have wider freedom of speech and can utter racist comments and make threats against others - while Jews can't. And so on. - Upon annexation, implement a policy that offers adequate and even generous financial aid to Arab families willing to relocate abroad. A peaceful, humane annexation of the territories needs to be tried. As far as taking over Gaza first and annexing later, I just don't trust this or any other Israeli government to stand firm to foreign pressure to hand over Gaza to Fatah. 1) Annex Judea, Samaria, eastern Jerusalem, Golan. Put forth all the appropriate legal arguments. The documentation exists. The UN is bound by League of Nations agreements. 2) Once Israel has a firm and legal hold on the WB, proceed with Gaza. The demographic shift would soon be righted with a wave of new Aliyah. Why there is so much trepidation in Israel to even discuss this option among Israeli leadership is a mystery. The window of opportunity for annexation is closing fast. Daniel, listen to this if you can. Israel is already being accused of genocide and we're on a path to having those troops there anyway. That said I agree with your plan. Tracy, you don't understand the 'invented people' in Israel. Being nice to them only makes them beleive we are weak. I know them well, I was raised around them. Kahane was right. What do you think I meant about transfer. Pay them to get out. The other Arab nations will not bat an eye. They want the problem solved. Many Esav countries would take them in without a problem except for the 'known' terrorists. For those, send them to Saudi, they know what to do with them. In a Torah Jewish state, democracy does not exist. Let the rest of the world continue with their 'democracy' with equal rights to all. See how they fall. HaShem said we are to be separate from the goyim. I agree, we don't fit and they don't fit with us. If they want to visit the Temple when it's rebuilt, great, but they won't live in our Land. Simple. Goyim won't like it, but it's our promise, get used to it. Shiloh, I don't dispute that Jewish decency and generosity are regarded as weakness in the ME. But Israel's options are somewhat limited right now due to the way the world has ganged up against you. You really have to be careful now. Israel was transformed from a hero nation in 1967 into a pariah state in just a short time. Aside from the Israeli leadership's huge share of the blame in this, Arabs did an excellent job in destroying your standing in the world. And they had the eager help from the usual suspects in the West and from Israeli leftists. Arabs proceeded slowly, cunningly and methodically. For Israel to go now from pariah state to a strong Torah state, you also have to proceed in stages. First you have to secure the borders through annexation. Next, slowly empower the religious nationalists and disempower the left. There are multiple ways of doing this, and you can use every political, legal, psychological (PR) method available. 1) Stop foreign infiltration into Israel, particularly from Africa. Set up a UNHCR camp and let the UN take care and relocate every one of them. 2) Limit some of the Supreme Court powers. You need only a majority vote in the Knesset. There is a proposal that would change a Founding Law to state that the Supreme Court does not have the final say on “security matters directly relating to the preservation of human life.” Founding laws can be altered via a simple majority vote. Israel must not give the UN and Obama justification for an invasion. But a lot could be accomplished in the meantime just by using national and international law to your advantage. There should never have been an agreement to divide Israel, to begin with. This is disobedience to God. ENOUGH of palestinian whining, already! Former Tunisian president Habib Bourguida said "The only way to destroy Israel is through "Peace". SK/DG: in your article The Liberal Betrayal Of Israel (one of your more zealous works, and a fantastic read) you talked about the Left hating Jews because of all the things referring back to scripture. and "They want us to forget, because A PEOPLE THAT DOES NOT KNOW IT'S OWN POWER IS ALREADY ENSLAVED. ... In the last century, we remembered that we were the descendants of kings and warriors..." etc, etc. We must always remember "The Lord did not set His love upon you, nor choose you, because you were more in number than any people; for you were the fewest of all people: But because The Lord loved you, and because He would keep the oath which He had sworn to your fathers...."
The whole world rages against Israel, that little sliver on the map. WHY? Can they not find any more obscure, tiny little nation to revile- and yet SO covet Jerusalem at the same time? God's math is unique. Before His victories were (and shall be) multiplied, there is subtraction of human capacities and strength. So that only HE can be glorified, not people He uses or saves. II Samuel 7:23 .." who is like your people, like Israel, the one nation on earth whom God went to redeem for Himself as a people, TO MAKE FOR HIMSELF A NAME- and to do for Yourself great and awesome deeds for Your land." . ALWAYS the purpose is to reveal to man The One True God. The battle cry of wretched souls have always been that they will not be ruled by God. The time of Zechariah 12-14 is at hand. "Behold, I will make Jerusalem a cup of trembling to all the people round about, when they shall be in the siege both against Judah and against Jerusalem........ though all the people of the earth be gathered together against it....In that day shall the Lord defend the inhabitants of Jerusalem....it shall come to pass in that day, I will seek to destroy all the nations that come against Jerusalem...."
So it is true A PEOPLE THAT DOES NOT KNOW IT'S OWN POWER IS ALREADY ENSLAVED. Israel, therefore, must remember His Intent: to "MAKE FOR HIMSELF A NAME". If Abraham had not caved in and tried to "solve" the problem of God's IMPOSSIBLE Promise, then the Arab nations would never have existed. So let us learn from history, that it is dangerous to meddle in God's Promises. Tracy, there are many who know exactly what to do. Until haShem puts them in place we will be in a difficult situation, truly to become dangerous over the next while. Don't worry, we will be invaded. We are in an interesting time as you probably are very aware. Just remember this even if you don't understand it today, that haShem has sent the answer before the problem exists. Most, if not all but a handfull don't know it either. Thanks for your support. Israel is in a lose-lose position. And surely whatever she does re Gaza, nothing good will come of it while The Great Dhimmi is in the White House...? That said, I definitely think Israel should stop sending aid etc in and leave it all to Egypt. Let the world see what happens to the Gazans without Israel helping them. Egypt couldn't give a damn. I've always believed and still do that Israeli PR could be a million times more effective - and it DOES make a difference. The Pallies have wonderful PR and it hoodwinks virtually everyone. Israel needs better counter measures. Yes, I know that Israeli 'shouldn't care what people think, but I've seen here in the UK how Brits are swayed by the anti Israel coverage and the pitiful Israel response to that bad coverage, and how they then pressure MPs to sever ties with Israel. A sobering article and very thought provoking, Sultan. The problem is that Israel is always on the defensive, with the PR. It's time to start playing by the same rules as the Pals - time to start running footage of Israeli children and women being slaughtered by Pallies. Yes - it's not our way. But I view it as a necessary evil. I think it has to go well beyond that and address the narrative. The world has seen Islamic violence, but it attaches justifications because of an underlying narrative that places them in the right. Allow embassies ONLY in Jerusalem. Daniel, that's all very well about the narrative, but remember that the narrative came well after the settlement of the EurArb Dialogue. First the EU agreed to betray Israel for Arab oil and markets - THEN came the cultural antiIsrael push. That is what gives the antiIsrael stuff its push. The campaigning is the fur on the body of the Arab-European bloc wolf.